The Succulent Garden is situated on the north-western ridge of the Garden, where it is hotter and drier than the southern side. It is environment ideally suited to the growth of our succulent riches – a water-wise garden in its own right! Fascinating succulents with contrast in form, colour and texture are displayed. Aromatic pelargoniums planted in separate beds offer another level of sensory experience to the visitor. A variety of fascinating Euphorbia species can be seen in the warmer, rock-landscaped area that is so typical of Africa. Many bees and nectar-loving birds visit the flowering plants during autumn. Another must see is the selection of spectacular succulent plants collected from one of the world’s most endangered habitats, namely Madagascar. 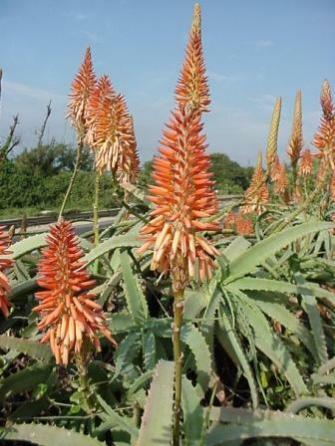 These include baobabs, Alluardia, Dideria and Aloe species. 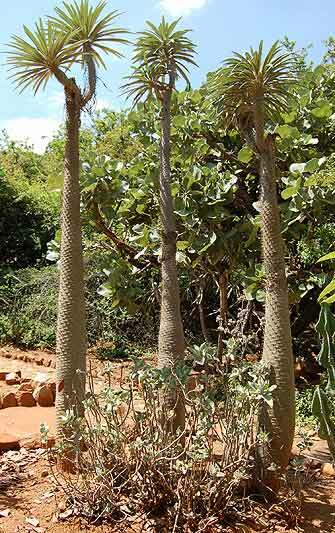 These plants are an excellent example of the evolutionary links that exist between southern Africa and Madagascar. Caudiciform plants that are highly adapted to arid areas are also displayed and stand out like living sculptures of nature.